לאחר כמעט אלפיים שנות עוינות וניכור הדדיים, אנו החתומים מטה – רבנים אורתודוכסיים המנהיגים קהילות בהווה ובעבר, ישיבות ומוסדות בישראל, בארצות-הברית ובאירופה – מכירים בהזדמנות היסטורית הניצבת בפנינו. אנו מבקשים לעשות רצון אבינו שבשמיים ולקבל את היד המושטת לנו על-ידי אחינו ואחיותינו הנוצרים. עלינו כיהודים ונוצרים לעבוד יחד כשותפים על-מנת לעמוד מול האתגרים המוסריים של ימינו. המשך קריאה: Catholic Messianic Judaism: Oxymoron, Utopia, or Divine Plan? God has never stopped believing in the alliance made with Israel and that, through the terrible trials of these past centuries, the Jews have kept their faith in God. And for this, we will never be grateful enough to them, as the Church, but also as humanity at large. Why Don't (Most) Jews Believe in Jesus? I have recently returned to Jerusalem after an absence of seven months abroad. During this time, I had many conversations with Catholic friends about Judaism. To many of them it seems incredible that most Jews still "don't get it" that the Messiah has come. 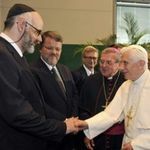 The present reflection is addressed to Christians who wish to better understand the rationale for the Jewish rejection of Jesus and of the Church and wish to try to see the perspective from the "other side." המשך קריאה: Why Don't (Most) Jews Believe in Jesus? View videos showing the highlights of Pope Benedict's visit in Israel. Benedict's visit to the Holy Land was and probably will remain the most complicated and sensitive trip of his pontificate. Even before he arrived there was a sense in the air that "anything that can be misinterpreted will be." Now that the dust has settled, it is fair to say that the trip generated very mixed feelings.